Further enhancements have been made to the popular Inglis Classic Yearling Sale for 2015 including first season sires incentives and revised dates to suit Inglis’ progressive sales series. Free entry and an early 14 day vendor proceeds payout is offered for the progeny of first season sires in the 2015 Classic Sales. The Summer Book has moved to 8 and 9 February next year and an Autumn Book will be offered on 10 May as part of All Aged Week in Sydney. “Classic continues to grow as a platform for the tough, precocious sprinter milers that Australia is so well known for. Next year’s enhancements will further highlight to our expanding buying bench the prime colonial product that buyers at Classic desire,” points out Mark Webster, Inglis Managing Director. The 2014 Summer Book saw 50% more lots sell for over $100,000, including yearlings by first season sires Star Witness and Rothesay. The progeny of Per Incanto averaged over 15 times his service fee at Classic this year. The first 2YO Group winners for Snitzel, I Am Invincible and many other stallions were purchased by their respective trainers, owners or syndicators at the Classic Yearling Sale in Sydney. “Buyers come back to Classic year after year because of the great racetrack success they have with the progeny of young sires and proven stallions. We are very excited to take Classic to the next level with the added vendor incentives and better timing for buyers in 2015,” adds Jonathan D’Arcy, Inglis National Bloodstock Director. 37 sires have had progeny sell for $100,000 or more at Classic since 2010 including I Am Invincible, Nicconi, Myboycharlie, Big Brown, Star Witness, Rothesay, Street Sense, Teofilo, Northern Meteor, Sebring, Ready’s Image, Magnus, Excellent Art, Not A Single Doubt, Bernardini, Strada, Dubleo, Choisir, Magic Albert, Hussonet, Tale of the Cat, Charge Forward, Dubawi, Fastnet Rock, Snitzel, Stratum, Beautiful Crown, General Nediym, Al Samer, Dane Shadow, Oratorio, Starcraft, Commands, Tiger Hill, Lonhro, Dash For Cash and Canny Lad. 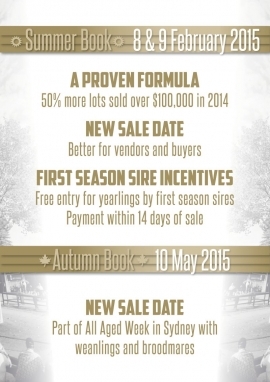 Inglis’ simple online entry system is available for breeders and vendors to enter their yearlings into the 2015 Inglis Yearling Sales Series.